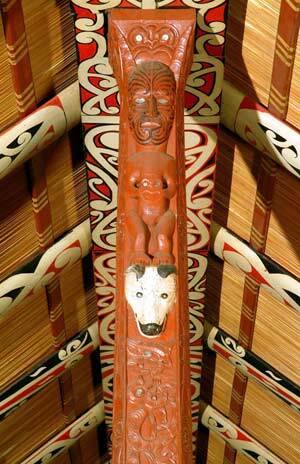 Incorporated in this carving is a depiction of the dog, called Pōtaka Tawhiti, who belonged to the ancestor Houmaitawhiti. The carving is inside the Tamatekapua meeting house at Ōhinemutu. Māori kept and ate dogs (known as kurī) which are now extinct. The Te Arawa people would often serve food to visiting chiefs in food bowls carved in the shape of a dog. These bowls were known as pōtaka tawhiti. A Te Arawa tradition relates the tale of the explorer Īhenga’s dog, which was also named Pōtaka Tawhiti. When hunting kiwi in the Rotorua area the dog, after being separated from Īhenga, chanced upon a lake and wolfed down the whitebait he found there. After rejoining his master he threw up the whitebait, and Īhenga realised that the dog had found his people a valuable source of food.